I’ve been thinking for a while about what to say about this book. I could do a bunch of research and go into the history and politics of First Nations land disputes and Treaty Rights in Canada. I could give you my opinion about how all the issues should be solved. But, I think I will just let the book speak for itself, because, regardless of history and people’s thoughts on the subject, land disputes don’t seem to be going away, which tells me that no one seems to be coming up with any kind of solution that satisfies everyone. 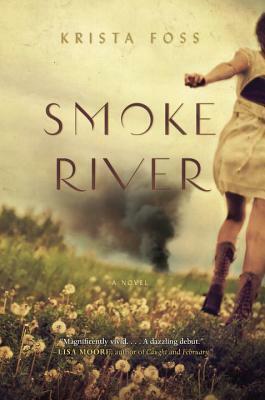 This is the very reason why I think Smoke River is an important book to read. It brings awareness to issues that most people would like to just sweep under the rug. Smoke River is filled with interesting characters. Getting to know them all makes for a slow start to the book, but hang in there. Soon you will be pulled into the small town drama and racial tension that permeates this book. As you have probably already guessed, this story centers around a land dispute between the ‘Townies’ and the ‘Natives’. As Wayne Grady puts so well in his endorsement for the book, “… Krista Foss shows how a blockade raised by First Nations women against a development on Mohawk land can be a metaphor for the barriers that separate us all – Native from white, husband from wife, mother from son – on both sides of the divide”. This is an important and well-written book. It brings to the forefront issues that First Nations people have to contend with every day. Krista Foss takes what we see in the news headlines and humanizes it, delving into the lives of the people who are most affected by the events. Using her characters’ voices, she allows us to see all sides and perspectives in a natural and insightful way. I would recommend this book to anyone who is interested in a look at the relationship Canada has with the First Nations community. But, the story is much broader than that. It is about relationships within families; how tension can sever bonds and cause us to act uncharacteristically; it is about justice and pride; and it is about how land connects us all to our people and to our past. And, hopefully, reading this book will help us all to walk for a while in someone else’s shoes. That can only be a good thing. Her people called the place simply o’ta:ra, their word for clay as well as clan, for everything that was land and family and how who you were and where you lived were indivisible. … not everything of the past can be swept away, … choice and intention are palpable forces of resistance. Never let a fire go out if you expect to be warm another time. First missionaries and churches, then residential schools. And now legislation that defines a race by giving it no definition worth having. Hand out the funds and rights. Water down the cultural and blood ties. Keep everybody just poor enough. It’s the politest genocide on the planet. With all due respect, I must remind you that your ancestors borrowed our version of democracy and then abandoned it for something less democratic. Then you told us we must practise your democracy. At the end of a gun. … we’re not a culture, as you government people like to say. We’re a civilization. We have our own way of governing. We have our own civic codes, institutions. You just keep trying to take them away from us. This conflict will not be won with public relations. it will be won with history, the history everybody forgets. … what you choose to notice, and what you don’t, shapes your understanding, and so your life. If you want to learn more, this article about treaty obligations in the Literary Review of Canada, coincidentally, just arrived in my e-mail. I’m quite interested in this subject although I have not yet read much in this area, and I wonder if there is more fiction in Canada about indigenous people than here in the United States? I have no idea but I am interested in finding out more titles. I like that there are also personal family story lines woven in this book. Thanks for the review! Whenever I read about it, I wonder why I don’t read more of it, because it always interests me. I don’t know about the United States, but I’m sure there is a lot available if you go looking. Maybe start in your area? The interesting thing about this book is that it is the first one I have read that is about a First Nations community and characters but that is written by a non-aboriginal author (although I don’t know much about her personal family history, and I’m sure there are more that I just don’t know about). A few other good Canadian authors I have read a little of (but hope to read more) are Thomas King, Richard Wagamese, Eden Robinson, and Joseph Boyden. And, I would like to learn about others. Thanks for your comment! I love it when outside things, like that article, coincide with what you’re reading! Me too! It was a happy coincidence, as I was thinking about searching for a good one. This book sounds great — what did you think of it compared to The Orenda? It’s funny you should ask, because I thought about mentioning The Orenda as a good example of the types of books we could all read to gain a better understanding of the history of the country, and where some of the bad feelings that still exist might be coming from. Obviously, there are many more, but The Orenda is a good example of one that goes way back. There are also many written about the more recent path, about the residential schools, etc. The two books are very different, though, since one takes place 4 hundred years ago and one in the present. And, if you’re asking which one I like better, well, it would be tough to beat The Orenda! I was curious about this book because I remember the protests that took place in Caledonia. I heard so many stories in the media (whether true or not) about people afraid to drive through the area because the protesters would stop their cars and families having to abandon their homes because protesters were harassing them. I understand there is a long, deep history for the aboriginal people in that area, so I find so fascinating that this author has written about this controversial time, but focused on the lives of the people involved. A lot of people on Goodreads have been comparing it to the protests in Caledonia. I think it was a brave topic for the author to take on, but she did a great job keeping her story human and unbiased. I think you would like it. Very thought-provoking. It sounds like an all-around excellent read. It is. And the message stays with you. I liked this book, but my mom LOVED it. She literally wouldn’t talk to anyone until she was finished. Either way, i think it is an important book that should be read by more Canadians. Hint: Canada Reads!